Amateur radio opened the World to Ron and created a course for his life beginning with not only licenses in the Amateur Radio Service, but the commercial broadcast licenses as well. This led to the successful creation of an international telecommunications company where Ron's ham radio friendships played a major role in its success. Ron also did a stint as a Southern California broadcast radio talk show host. Ron resides in Orange County, California. His two grown children are also ham radio operators. After George, W6OM, became a silent key, Ron changed is call sign from N6VO to W6OM in his memory. Very glad I found your podcasts after searching for info on W6OM / FO5VO. 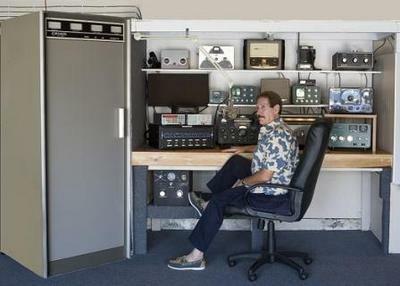 Ron's love affair with international ham radio and Tahiti is a bit of a parallel with my situation. His affairs are a little more developed than mine! Listening to this podcast was great fun. And these podcasts make us realize our unique journeys through ham radio aren't so unique. Me too, Jeb. Me too.